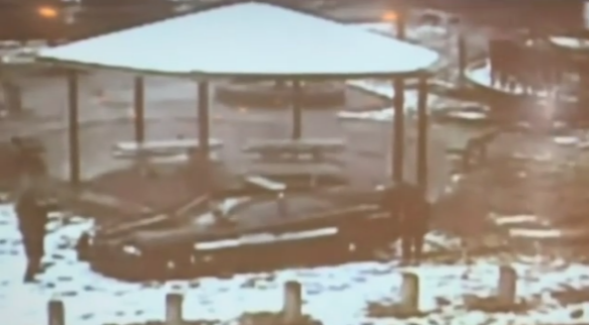 Grand jury issues no charges in Tamir Rice killing. From surveillance video of Rice’s death. A grand jury has declined to charge the officer who shot 12-year-old Tamir Rice in Cleveland on Nov. 22, 2014, Cuyahoga County prosecutor Timothy McGinty announced shortly after 2 p.m. ET at a press conference. (Rice died the next day.) McGinty said enhanced images from video of the shooting prove in “indisputable” fashion that Rice was drawing a pellet gun from his waistband when he was shot and killed by officer Timothy Loehmann; McGinty also said that he recommended to the grand jury that they not charge Loehmann or his partner on the scene, officer Frank Garmback. Surveillance video shows Loehmann and Garmback pulling up next to Rice; Loehmann shoots Rice approximately two seconds after exiting the vehicle. Loehmann testified to the grand jury that he “continuously” shouted “show me your hands” toward Rice before firing. It has been clear for months now that Cuyahoga County Prosecutor Timothy McGinty was abusing and manipulating the grand jury process to orchestrate a vote against indictment. Even though video shows the police shooting Tamir in less than one second, Prosecutor McGinty hired so-called expert witnesses to try to exonerate the officers and tell the grand jury their conduct was reasonable and justified. It is unheard of, and highly improper, for a prosecutor to hire “experts” to try to exonerate the targets of a grand jury investigation. McGinty hired a prosecutor and two former law enforcement officers who submitted reports presented to the grand jury which said there was not probable cause for Loehmann and/or Garmback to be indicted. You can read more about those reports here, and you can read a report here written by an expert hired by the Rice family who disputes the prosecutor’s claim that video proves that Rice was drawing the pellet gun when he was shot. Rice’s family has filed a wrongful death suit against the officers involved and the city of Cleveland and has requested that the federal government investigate whether Rice’s death involved any federal crimes. Correction, Dec. 28, 2015: This post initially misstated the date of Rice’s shooting.